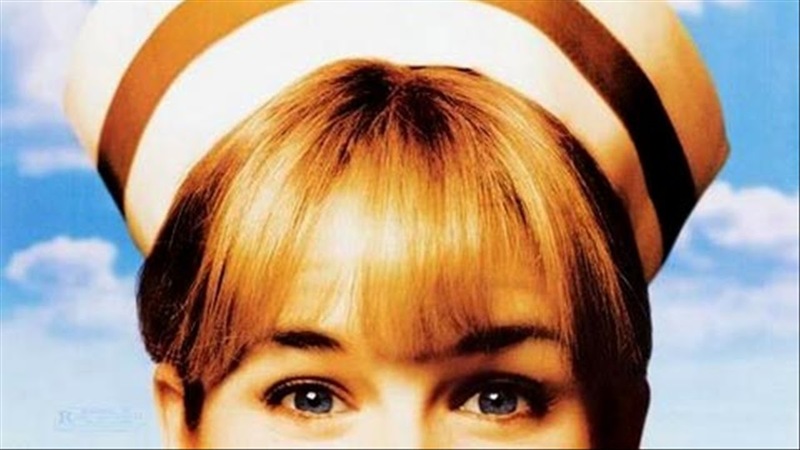 Neil LaBute’s “Nurse Betty” is one of the most audacious, bizarre and effectively conducted motion picture’s I’ve seen since “Pulp Fiction,” an over-the-map lampoon so well grounded on so many different levels, you gawk at it with a sense of sublime (but curious) appreciation. It tells the tale of a quirky housewife named Betty, who witnesses the brutal murder of her husband, and then drowns out her sorrows by absorbing the substance of several episodes from her favorite television soap opera. Daytime shows are generally used as innocent tools for escapism from some of our very own warped, complex lives, but Betty’s trauma has been so great, so extreme and hard-edged, she slips into a realm that mingles fantasy with reality, and actually begins to believe that she is linked to one of the show’s own characters. This inspires an intricate, offbeat storyline that operates on a consolidation of black comedy, satire, drama, romance, and at some points, even wild adventure. Renée Zellweger steps into the quirky title role, a Kansas-based waitress whose life is stuck in the same cycle day in and day out. At the outlet of the story, her car dealing husband Del (Aaron Eckhart, obviously LaBute’s trademark villain) hooks up with two “business men” named Charlie and Wesley (Morgan Freeman and Chris Rock), who murder him right in his own home after he invites them back to his place. Betty secretly observes these occurrences, alas, and she is so greatly shocked by the loss that she literally shuts down. The only thing that even mildly distracts her from the pitfalls of her newly-void life is watching the soap opera “A Reason To Love,” a show which carries the handsome and attractive character Dr. David Ravell (Greg Kinnear), to whom she fantasizes she was once engaged to. With those bizarre fantasies leading the direction, Betty packs up and heads out to Hollywood, where she hopes to be reunited with “David.” The actor who plays him, George McCord, has a rather intriguing response to Betty’s arrival, however; instead of seeing her as a crazed fan or stalker, as most Hollywood employees would in this reality, he thinks she’s a character actress who is totally into the material. And why shouldn’t he? Betty is a captivating presence on screen, who more than earns the viewer’s sympathy regarding the past that has lead her to this point of questionable sanity. Zellweger, who dives into most of her other material with grace and distinction, gives us the best performance of her career here. While this is all unfolding, though, the plot introduces a second storyline to accommodate the 112-minute running time: one that involves the two hit men discussed earlier, who fear that Betty’s eye-witnessing of the crime they committed could get them into serious trouble, and they decide to search for her. There is so much more involved in this situation than the first (just as a teaser, the Freeman character even begins fantasizing about Betty), but part of the fun of the movie is discovering most of the treats for yourself, so plot descriptions end here. LaBute’s vehicle is biting, fierce and sometimes shocking, but at the same time is sweet, nurtured and zealously conveyed. That’s because the talented director comprehends the perplexing nature of his material right from the start, and approaches it without a sense of angst undermining the potential. He is confident in the structure, piecing together all sorts of diverse atmospheres using an ambitious sense of humor, clever and incisive dialogue, and standout performances from Freeman, Zellweger and Kinnear as the cement. For a brief while, there was a sense of doubt that restricted some of my excitement, though (how can a movie, after all, possibly keep its mentality straight when there are so many possible errors in judgment that the material can make?). “Nurse Betty,” despite all of those opportunities, never pulls itself out of the line. It is a remarkable piece of filmmaking from the first moment until the last. This isn’t a movie for everyone, mind you; like his previous efforts—“In The Company Of Men” and “Your Friends And Neighbors,” both of which ranked in my runners-up lists of the best movies of 1997 and 199—LaBute’s moral structure has a narrow and fragile pathway, which makes it all the more easy for viewers to fall off the trail and get lost in the shuffling of the picture’s various tones. Some viewers, for example, will adore the lighthearted substance of Betty’s infatuation but despise the violent undertones; others will feel exactly the opposite on both issues. The bottom line here regardless is that “Nurse Betty” is a well crafted and executed film on all grounds, and based on those merits, plants itself on my list for the year’s best pictures.